The call of the wild right in your living room: that's the Toyger with its dramatic striped and glittered pelt. The Toyger is being bred to resemble the tigers of the wild but in a package that fits easily into the modern urban lifestyle with the same nature as the domestic cat. The medium-sized cat has the rolling gait and vivid striped patterns of the wild cats without a single drop of real tiger blood. These miniature tigers are friendly outgoing cats that delight in being with their human companions. A young breed, the Toyger is in development as breeders work to replicate the pattern and colours of the tiger with ever-increasing accuracy. Tigers are an endangered species in the wild and many of the Toyger breeders are also very concerned about conserving the beautiful wild species that cats are created to resemble. People often refer to mackerel tabby cats as tigers or tiger stripes and yet their pattern is a far cry from the bold braided patterns of the real tiger. In the late 1980s, Judy Sugden was working to improve the clarity of the mackerel markings in these tiger cats. She noticed that her cat Millwood Sharp Shooter had two spots of tabby markings on the temple and realized that this could be a key to developing a cat with the true circular pattern on a tiger's head. The temples of domestic tabbies do not usually have such markings on the head. 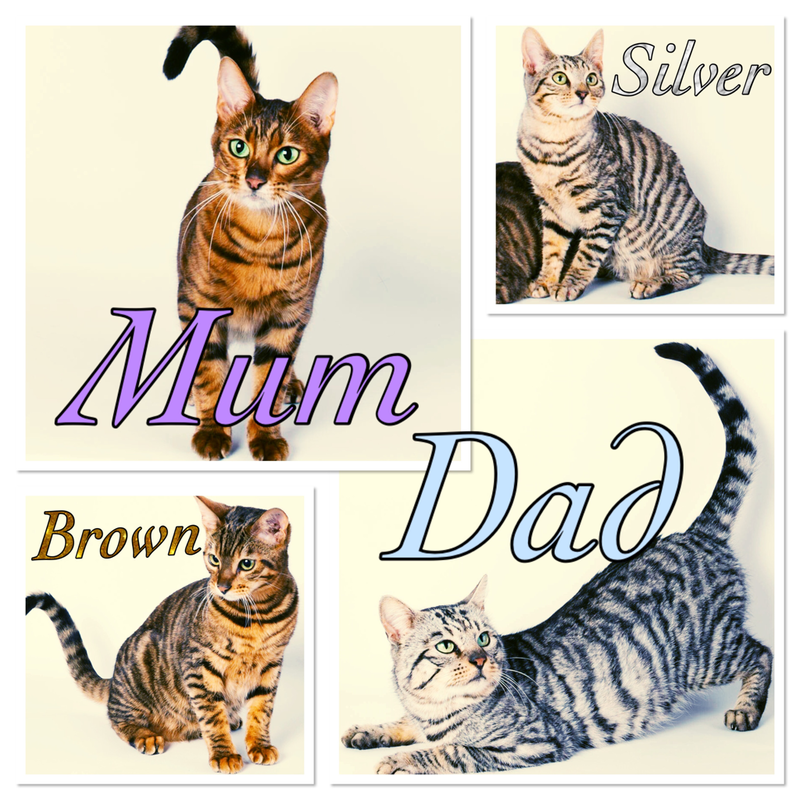 Two cats that formed the cornerstone for the young Toyger breed were a striped domestic shorthair named Scrapmetal and a big-boned Bengal named Millwood Rumpled Spotskin. In 1993, Judy also imported Jammu Blu, a street cat from Kashmir, India, who had all spots between his ears rather than the regular tabby lines. Judy embarked on her program to develop these toy tigers with a firm picture in her mind of the characteristics that would be needed to replicate the tiger in this miniature form: a large, long body to display the bold vertical patterns; a stretching and branching of the tabby patterns and rosettes found in other cats that would break up and elongate those patterns; the circular head markings found in no other domestic cat; the vivid glittering colours; and most importantly a laid-back temperament to make the Toyger a delight to live with. Joining Judy early on in this pioneering work were Anthony Hutcherson (JungleTrax) and Alice McKee (Windridge). In 1993, TICA accepted the Toyger for Registration and in 2000 advanced them to the new breed exhibition classes, finally granting them full recognition as a championship cat in February 2007. The Toyger coat pattern is unique in the domestic cat. Instead of the vertical stripes of the mackerel tabby or the rounded rosettes of some spotted tabbies, the Toyger has broken, or branched, bold vertical stripes in a random pattern. Some of the stripes resemble rosettes that have been stretched vertically. The goal of the facial markings is to have a circular pattern. As with the tiger, the colours being sort are dark markings on a vividly bright orange background on the outer to top portions of the cat with a whited ground colour on the undersides and insides. These beautiful dramatic patterns, each of which is unique to the individual like a fingerprint, are enhanced by the scatter of gold glitter over the top to enrich the coat pattern even further.